The gray mist draped Derby Street like a leftover from Halloween the week before and suited my mood perfectly. I had ventured to Salem alone with hopes of testing my brand new camera, but the weather refused to cooperate. The November chill was just another dreary reminder that it was my anniversary. This trip was an escape, part of an unscripted journey I began a few weeks earlier when my marriage suddenly shattered. Looking to get out of the damp cold, I decided to explore the House of Seven Gables instead. I was searching for the elusive parking space when she caught my eye. Moored at the end of the pier, her pirate ship hull stood starkly different from the scores of shiny sailing vessels that filled the harbor. There was something defiant and strong about her that drew me in. I parked my car and wandered into the marina, never taking my eyes off her. I managed to snap a few quick photos despite the heavy mist, but was so fascinated by this unusual boat I almost forgot I had the camera in my hand. As I neared, I saw a sign on the pier inviting everyone for a tour. I looked up and decided to climb aboard even though the tours were almost over. Stepping onto her deck affirmed my notions that this was no ordinary sailing ship. She was ruggedly beautiful, with the signature of handcrafting everywhere I looked. There was an energy about her, a sense of determination and struggle that resonated somewhere deep within my heart. Like me, she was different, as if the face she presented the world hid the story she lived. Her captain was standing on deck, attending to his chores and talking to the few remaining visitors. I shyly asked him if I may photograph a few sections of the deck that were roped off from the tour. 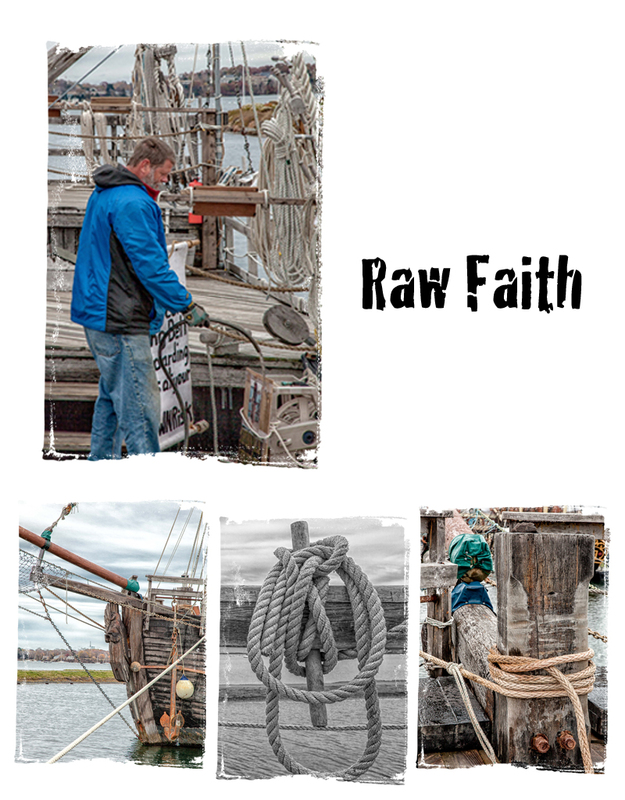 He nodded an OK and told me her name was Raw Faith, cautioning me to watch my step as I walked around the wet deck. Feeling a little awkward as the only person left aboard, I halfheartedly took a few pictures of her details and went over to thank him for his time. His name was George McKay. He asked if I had eaten lunch yet and would I indulge him by sharing a pizza. I thought about it for a moment, wondering if I was crazy to accept the offer of a complete stranger, but the rumbling in my belly made my decision for me and I agreed. He secured the deck and we walked across the street, grabbing a table in the corner of the pub. As we waited for our lunch, he told me the tale of Raw Faith. I sat watching his face as he talked about his dream, one that would make it possible for his daughter to travel, despite the limitations of her wheelchair. He spoke of his wish to share the splendor of the sea with others who faced similar difficulties. It was a such a noble dream, and his eyes came alive as he poured it out to me. 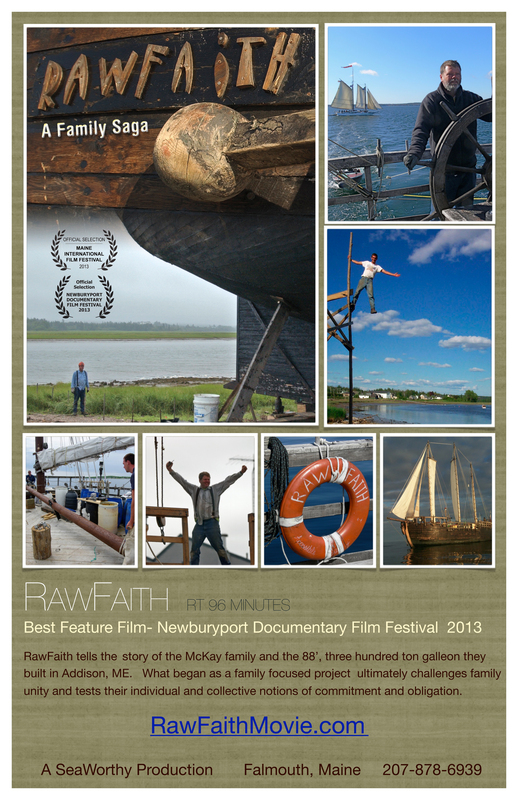 I could sense the struggle behind his journey even before he told me how Raw Faith had grown from dream to reality in a little town in Maine. It was written in the lines of his face and reflected in hands that had seen their fair share of weather and hard work. A labor of love, her massive 88 foot, 200 ton hull was built entirely by hand with the help of his sons, family and friends. His love for them was vividly clear, as alive as the passion for his dream. He confessed how it eventually consumed him, consumed them all, until one by one they turned away, leaving him to sail the dream on his own. His pain was palpable, but his determination was unflagging. As he finished his story, I reflected on my own pain and the journey I unexpectedly found myself on. He asked about me, and I answered him almost sheepishly, feeling my own saga quickly pale in light of his poignant one. I spoke of the life that fell apart and my fear of where the road would take me. I revealed my own dream of traveling with my camera, capturing life through my lens and sharing it with the world. He smiled, a silent understanding hanging between us. We were two strangers sailing our own uncharted waters, our wakes trailing the debris of broken lives, both clinging to a dream only we believed in. Neither of us knew what lay ahead, but at least for this one moment we weren’t alone. I asked him what wind kept him sailing despite all he had lost, through all the storms life threw in his path. He looked at me and said simply, raw faith. The pizza was gone, the long light of late afternoon was fighting to burn off the gray mist and it was time for us to part ways. We raised our mugs to toast our journeys, to mourn our losses and celebrate what was to come. As we said our goodbyes, Captain George asked me to promise I’d never give up my dream, to keep sailing in spite of the storms and never stop taking my pictures along the way. We vowed to stay in touch, agreeing to meet again when they were settled in another port. I wished him safe travels. As he walked back to Raw Faith, I stood watching her, even more in awe of her strength and defiance after knowing her story. Suddenly I knew, I understood. 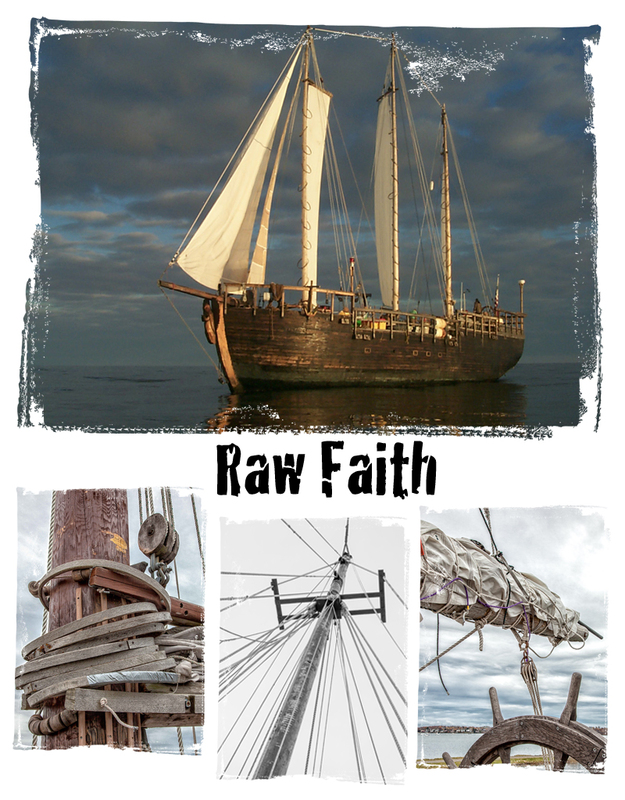 It was the last time I would see Raw Faith. She left Salem just a few weeks later and was lost in an early December storm, swallowed by 6000 feet of an unforgiving sea. I only met her and her captain for a day, but they left an indelible mark. I remember how proud and strong she looked as I left the marina that afternoon. I still often think of George’s parting wisdom and remember how he and his incredible boat inspired me, igniting a tiny flame of hope. I still carry that inspiration with me, determined to follow my dream through life’s many storms, always clinging tightly to my own raw faith. I am happy to report that I was finally able to get in touch with Captain McKay. He is alive and well, writing his story from dry ground. it’s interesting how the pursuit of a dream can demolish the one you might already have. is there room in a life for too many dreams? Mike, Thank you very much for the compliment! I don’t think one dream demolishes another so much as pursuing one’s dream leads to others. Often in the pursuit we find our true selves and choose to take another path we may have never noticed otherwise. Beautiful. Thank you for sharing that experience. I thought this piece was extremely well written. My first impression was that it had to have been written by some well known photojournalist. Very interesting story.